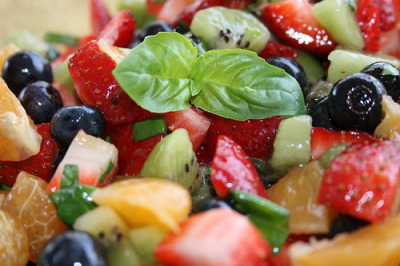 This is a super healthy and delicious fruit salad of pineapples, oranges, strawberries, blueberries and Kiwi. It is flavored with citrus juices and sweetened with honey. 6 to 8 servings. Combine pineapple, oranges, strawberries, blueberries and kiwi in a bowl. In a small sauce pan, combine orange juice, lime juice and cilantro. Pour through a wire mesh strainer into a bowl and discard cilantro. Pour over the fruit mixture and gently toss to coat.